A program to remotely control PCs would be the exact definition but, in practice, "a savior in times of need" may be the better description. TeamViewer connects two (or more) PCs. This means you are able to remotely control another computer from afar to provide assistance. Are you having issues with your PC and know someone who might help but doesn't live around the block? That would be a typical use case for this program. Key advantage: The helper can view exactly what you see on your monitor and even take control of your machine. Video conferencing or file transfers are also possible between connected PCs. First, the TeamViewer application has to be installed on both devices. You will then receive a unique ID (to identify your particular device) and a password (access permission). Once you give both to the helper, he will use this information to set up his TeamViewer client. Finally, you will need to confirm that you allow the helper to access your machine - and then you'll be all set. Let's assume my dad is having problems with his Outlook client. He has set up a new email address and has very little ambition to get into the details of SSL encryption, POP servers and port setups. He fires up his TeamViewer and sends me his ID and password. I use this information in my TeamViewer client and make a request to connect to his machine which he acknowledges - so I can now see what he sees on his display, move his mouse, perform user interactions and take care of any issues. When I'm done, I disconnect from his machine and he then has exclusive control of his PC once again. This is why IT pros like to say that TeamViewer joins more families together than X-mas. For all we know: very safe and secure. There have so far been no reported man in the middle attacks (where a hacker manages to sit between two connected devices and acts as a relay). 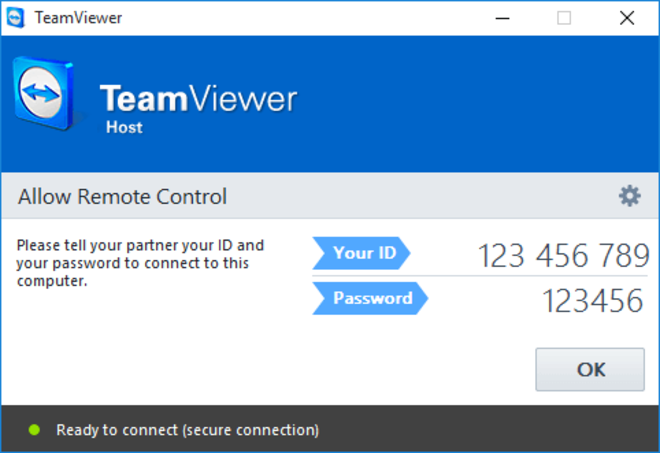 TeamViewer employs RSA-2048 public/private key exchange technology along with AES-256 bit end-to-end encryption that is nearly unbreakable with current technology. And there is no risk of someone connecting to your machine without your knowing since you have to manually confirm every connection request. For private use? It's completely free! Only if you intend to use it commercially, e.g. to set up a help desk for business users, will you have to obtain a license that starts at $500. Helping your friends and family is and will remain free of charge! You'll need two Internet-capable devices. The software itself is available for various operating systems including all common Windows versions, Mac OS X, Linux, Android, iOS, Windows Phone and BlackBerry. That means you can hook up nearly any two devices with TeamViewer even across different operating systems - a definite plus! 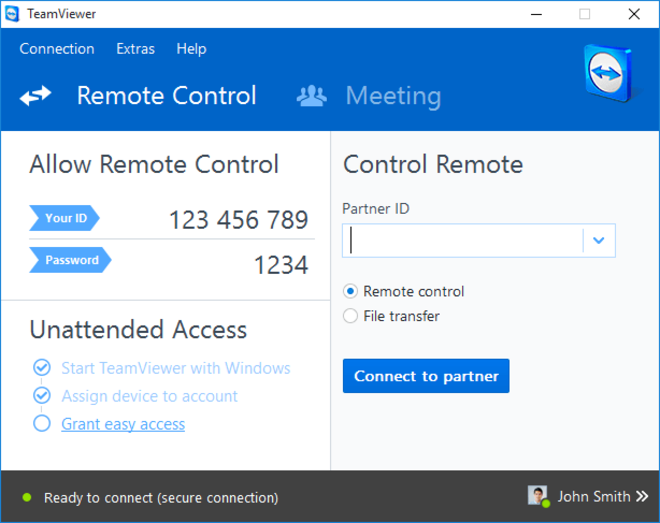 Naturally, you can also use TeamViewer to remotely control and maintain your computers at home on the go or access and have your files sent to you. Headless Linux machines (without a graphical user interface), multiple display environments, local printer access and many other configurations are also supported. You know me as a (sometimes overly) critical, responsible user but I do consider TeamViewer a truly useful application. It's easy to set up and use, comes with many helpful features and cause any noticeable system lags or slowdowns. Errors are few and far between and their support staff is capable and highly motivated. The program handles shaky / slow Internet connections very well, works with proxies and firewall setups and has earned its spot in the standard toolbox of any who like to provide or receive help with their computers.